The sound may have a deeper dimension than the West admits. A phono amp from the lab of truth. Some time ago Iram Tauqir, a research assistant at the Department of Philosophy at Sanjan Nagar Institute of Philosophy and Arts in Lahore, Pakistan, contacted me and suggested a meeting in Helsinki where she and her colleagues, Noor Zehra (musician and musicologist) and Sadia Tariq (a researcher in philosophy) would attend “Towards a Science of Consciousness” (TSC) Conference at the University of Helsinki. Together, they would present their research paper on the role of serious music in the development of a human, non-conceptual mind (”Serious Music — A means for communicating with, observing and evolving our non-verbal mind”). The purpose of the meeting was not just philosophy or music, but something heavier – literally! – a sizable wooden box, which the three women had draged from Pakistan to Finland. 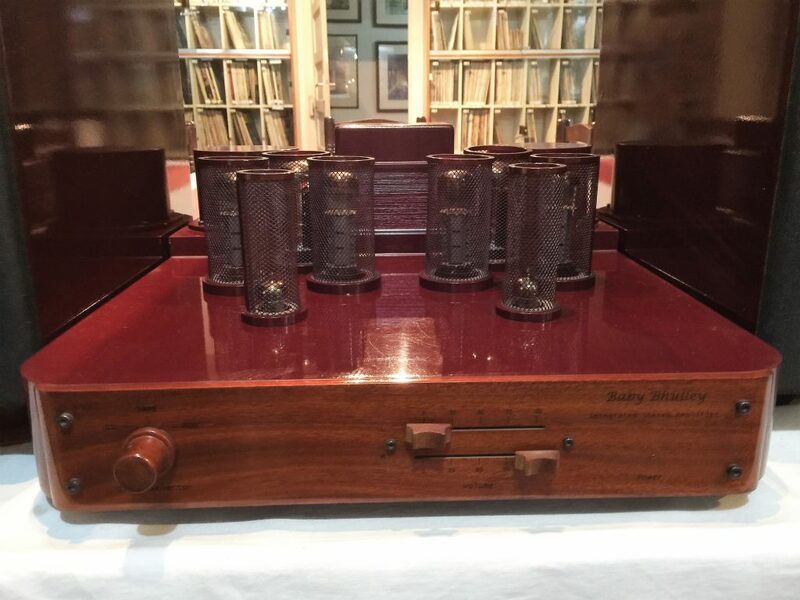 Inside the box, protected by the red velvet, lied the exotic MM/MC Bhulley Phono preamplifier, as well as its external power supply, designed and manufactured by the Institute’s Audio Engineering Division. To my confused questions about the Institute’s unexpected combination of study fields (philosophy, photography, hi-fi electronics, etc.) Iram and her colleagues answered with kind enthusiasm. To the technical details, which they were generally quite well aware of, they promised additional insight later if needed. Iram had even mentioned the possibility of carrying along the entire Bhulley Boy playback system with loudspeakers and amplifiers and so on. That would have been too much. The Bhulley Phono amplifier alone demanded biceps and shoulders. 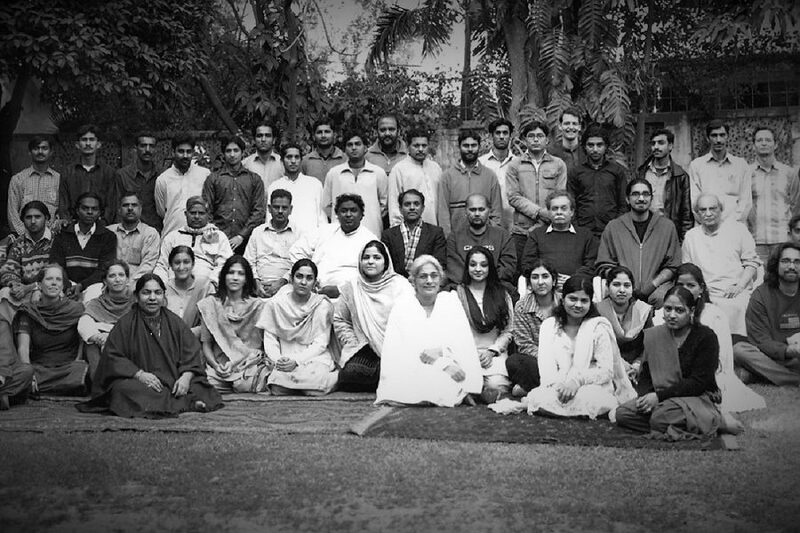 The Sanjannagar Institute was founded in 1995 as a non-profit private research institute. The Institute defines itself as a “home of truth-seekers”: a laboratory for searching, studying, testing and developing new ideas and concepts as well as practical methods and tools for transforming human being and society philosophy, music and photography as research topics. The music division is devided into four sections: musicology, instrument development and production, sound engineering and recording technology (eg. the Institue has its own condensation microphone and microphone amplifier a la Neumann and Siemens). The Audio Engineering section is divided into smaller units, one for amplifier design, the other for loudspeaker development, the third for making components, especially capacitors, and so on. All the products of the Institute carry the name Bhulley, after a famous Punjabi Sufi poet, “Bhulley Shah”. The production program encompasses two different integrated amplifiers, two mono power amp models plus bi-amped and tri-amped speakers with amplifiers. The flagship speaker is a five-way model. Each element is driven by a dedicated band-limited amp. And note: they’re not miniature digital amplifiers with dsp filters, but analog ones built around tubes! Most amazing is that apart from tubes, some resistors and diodes – and the 0.0032mm ja 0.0040mm thin cable used in the voice coil of the tweeter – almost everything is made inside the walls of the Institute, from capacitors to speaker elements, from transformers to cables, and so forth. For example, all of the caps on the signal path are their own. How many amplifier or speaker manufacturer can claim the same? This is what ”handcrafted” really means. It’s not the handcrafted just for the brochures, but literally. According to the Institute, they have numerous accepted patents related to audio technology. Some of these apply to devices and technologies that “radically” differ from the existing ones. One example. One Bhulley loudspeaker sports a double front panel water inside the baffle; water because it is ”virtually the most effective absorber of resonances”. But it took eight years from them to successfully and safely implement the idea. Separated from the commercial audiovisual world, the Institute, some years ago, arranged an external evaluation of its work. Encouraged by the British and American experts, the Institute has, after 2011-2012, made changes to its systems and equipment, and keeps itself always open to an external “objective evaluation”. Has the work done so far have had true value? And if so, in what direction should one proceed in the future? Before dealing with concrete results, the Bhulley phono amp, it is important to understand that the work done, its quantity and quality, has hitherto been achieved without any commercial motivation or plan. All 20 employees of the Audio Engineering Division team are laypersons without a degree in electronics or previous experience of making such products. The Founder and Director of the Institute, Raza Kazim, is a great music lover, researcher and even an audiophile, but a lawyer by training. The project, which started almost 20 years ago, has been aimed at excellence in making instead of money. Another goal has been the rediscovery of South-Asian classical music, and enable its high quality recording and reproduction. However, the Institute would not mind if the work painstakingly done finally would got some financial appreciation, not least because it would be humanly important to people working in the Audio Engineering department. Until now, they’ve been working mainly out of the pride of being able to produce high-quality devices valuable for music listening. Despite the cautious commercial opening, the Institute and its Audio team is prepared for monetary disappointments, and as far as I know, the work continues, whatever the commercial scenario. Here’s one of the tube amps made at the Institute’s Audio Engineering department. Surveys have revealed eg. that subtle signals in the music observation processes have a huge impact on what sort of meanings people give to the sound of the music. In the background, there is a broader philosophical and aesthetic conception of the relationship between “musical processes” and the human mind, and about how certain contents of human mind can be more effectively communicated through the non-verbal communication processes of music. The need to develop music reproduction systems grew out of this background. ”Sound” is seen as an important part of the human transformation on an individual level, part of rebuilding of thoughts, emotions and habits, and eventually functioning as a catalyst for social change. Behind all this is Raza Kazim’s conception of how in the Western world, the sound reproduction, after the WWII, had a strong tendency towards HiFi, by which he means a very mechanistic perception of the sound. In the Institute, instead, the reproduction of “musical reality” primarily concerns different music genres rather than HiFi in the traditional sense. This is easier to comprehend keeping in mind that the aim has been to accurately reproduce musical nuances that are poorly quantifiable, microintervals and other subtle changes as they appear in Northern Indian and South Asian classical music. Mr. Kazim has found that HiFi devices made in the West have obvious difficulties in this regard. More could be said about the philosophical foundation (eg. it is believed that music and arts in general can help people to refine their intellectual knowledge and understanding obtained from science), but what does this all mean in practice? I do not see any systematic answer here. There are thoughts about what kind of volume control circuitry an amplifier should have. Somewhere it is stressed that the signal path should have no resistors and that the capacitors should be of low value, and that wherever wiring is used, the cable should be pure silver, and so on. Perhaps the philosophical starting point fuels the work on a more transcendental level. Of every new device or component at least a dozen of prototypes are made. They go through a number of listening tests and alterations before the final version. 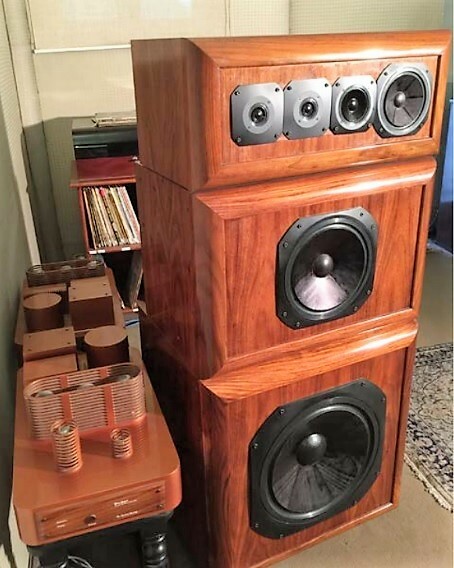 It was only after listening tests that the Audio Engineering Department decided launch the project of designing and making their own speaker elements. So finally, the Bhulley Phono amp. Like other Bhulley products, the chassis is made of wood and copper color metal. The same color for all Bhulley products. 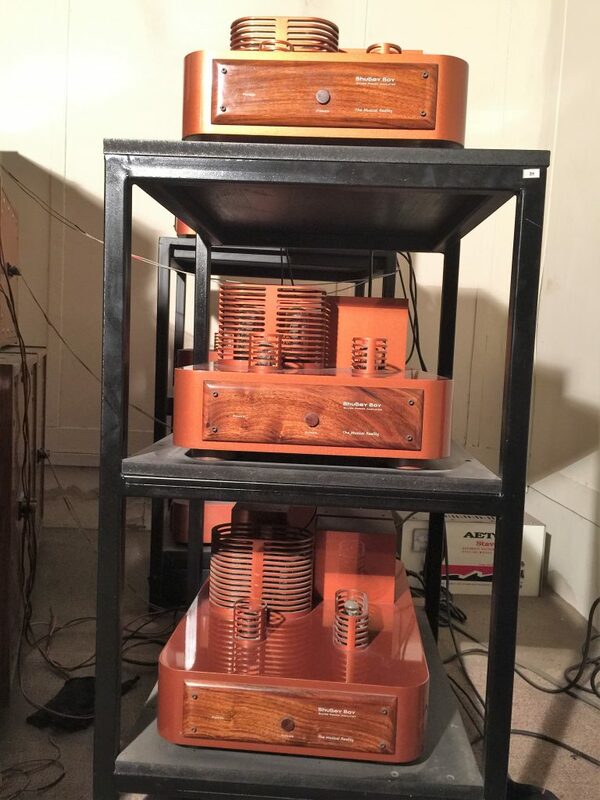 It’s an impressive looking amplifier (bigger than most phono amps I’ve seen) when you see it face to face. Finishing is not exactly on the Italian level, but fairly good anyway. The pre-amp is supported by spring-loaded wooden feet, which are springy mainly vertically. Underneath the external power supply there are really long conical wooden spikes. According to the info I received, the wood is always chosen according to the assumed resonance behavior of each device. Knowledge of the resonance behavior of different wood species is one of the pronounced strengths of the Institute. The MM and MC connections have a physically separate input circuits, a linear amplifier block. The MC block is realized around the ECC83/12AX7 and MM around the ECC82/12AU7 tube. There’s a switch for selecting either of these circuits in the signal path. Right after the pre-amp block a passive correction follows, where all time constants are placed in the same component package. Lastly, there is a linear amplifier block with ECC82/12AU7 tubes. Its first stage provides a gain of about 13 times, and the second stage is a directly coupled cathode follower in order to have a low output impedance. The coupling and the implementation are rather puristical, but correct. No obvious new theoretical breakthroughs. The design is based on tubes and solutions that have passed the test of time. I asked Mauri Pännäri, who had just finished with his new NOS 2N3819 JFET/ECC88 RIAA-stage, to comment on the technical side of the Bhulley Phono pre-amplifier. His best judgment, based also on his measurements, was that the coupling and the implementation are rather puristical, but correct. No obvious new theoretical breakthroughs. The design is based on tubes and solutions that have passed the test of time. However, I’d say that there are very few manufacturers that can place their own capacitors in the signal path, in this case silver foil caps. All cabling is also pure silver. These are not negligible matters in the final round. The cables (one for each channels) to the power supply are long enough for avoiding hum and other noise problems, and the AC filtering is particularly effective. Right after the AC transformer there’s a conventional RC filter for both the plate and cathode filaments. The transformer as well as other components here are by the Institute itself. The sensitivity of the MM input is 3mV with 47kΩ input impedance, 47pF input capacitance, and 43dB of gain. The figures for the MC are 0.3mv, 100Ω, 100pF and 54dB respectively. With regard to hum and noise, the Bhulley Phono Amp turned out to be an excellent implementation. With two separate system tried, there was no hum whatsoever, not even with MC cartridges. The bottom noise was detectable only when the pot was in the extreme position. As to the amp’s overall sound quality, it was somehow apparent that the device was built around tubes. By this I mean that the sound had a nice inhale/outhale character, no soap bubbles around the instruments that were just living freely in the space. Above all, and over-generalizing a bit, the sound lacked the flavorless anoxia, which inflicts many transistor designs despite their formally correct sound. Tube-like unfolding and release of the sound is a different thing than the soundstage the device creates. The perspective of the Bhulley Phono Amp opens up is wide, but not overwhelmingly so. Sidewise the instruments are where they should but without pinpointing. Above all, and over-generalizing a bit, the sound lacked the flavorless anoxia, which inflicts many transistor designs despite their formally correct sound. The tone of the Bhulley Phono sound has a certain gentle warmness in it that renders delicate acoustic music with an appropriate, not exaggerated presentation of details, and softness required by that type of music (eg. periodic instruments of a baroque orchestra). However biased the sound may be, it’s never distorted. The surface softness of the sound translates slightly into the lack of direct power and the presence of the lowest bass. There were recordings with which the gain of the MC part seemed not to be sufficient to full bass kick and heavy beat, if that is what is searched, with 85dB sensitive speakers. The bass part remained under the shadow of the middle range when the music told that the bass should have kicked in the forefront. To some extent, it’s a personal matter, how much weight this feature of the sound should be given. For those who miss the dynamics, I would recommend using a low-output MC cart, and connect it to the Bhulley Phono’s MM input via a suitable MC stepup-transformer. 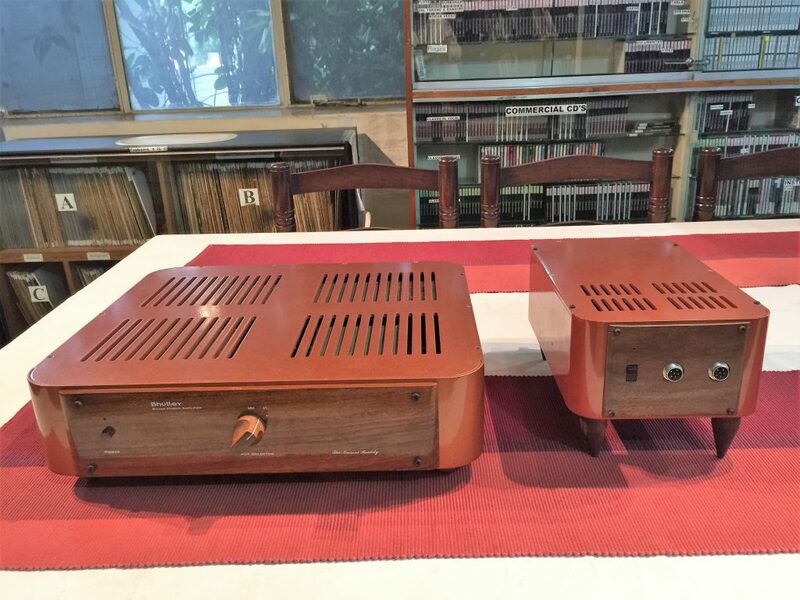 Personally, the exquisite sounding Bhulley Phono Amp provided all the resources what an art-music lover would ever want from a phono-amplifier. Since I received the Bhulley Phono Amp for the review, the Institute has come up with a new modified version of the Silver Phono pre-amp with a number of changes. In Silver Phono V3, the tube of the MC input stage, 12AX7, has been replaced with 12AU7, and the stage sports now MC step-up transformer (Jensen JT-44K-DX). The values of the output coupling capacitors have been increased, and the cathode follower circuit has been changed into CCDA type cathode follower circuit. Also, cathode bypass capacitors have been added to the input gain stages. The power supply has changed too, eg. with more efficient regulation. Naturally, I cannot say anything about the new amp’s sonic potential except that, obviously, the changes have been made to improve the sound. The goal prescribed for each Bhulley device, clearly exceeds, in its spirituality, the goals typically imposed on such devices in the Western world. However, the devices are just one thing. But most amazing is this: to develop sound reproduction devices that would be competitive with the world’s best similar devices, but do it with a team of novices! It all started when Raza Kazim hired a group of non-professionals with their knowledge and life experience, and wanted to see what would happen, if these people were given not only some resources, but also the access to knowledge and experience that is nowadays found eg. on computers and on the net – “the gift of the present-day”. What would happen if they were given the opportunity to develop themselves, to find new facets and strengths and let work together with other team members to achieve a well-defined goal? So the Institute acquired a stack of computers and hired a math tutor for the team. The learning curve may not have as rapidly rising as possible, but the fact that employees were not educated was a deliberate decision, and no one was kicked out because of slow learning. Think about this. It’s not about technology. It’s not about sound. It’s not even about music. It’s about people having to change themselves, heart and mind, in order to create something great together. Now, 20 years later, the team has developed almost everything by itself and mostly from scratch by studying what’s been done elsewhere and so on. A total of 21 prototypes and a series of accepted patents speak their own language. I don’t know any audio manufacturer in the West who would have come even close in arguing for their operation in terms of human excellence and development. The job is now at the stage and the team at the age that it’s time for “leaving home”. If the team succeeded in commercializing their work even for some part, it could perhaps volunteer to act independently of the Institute!